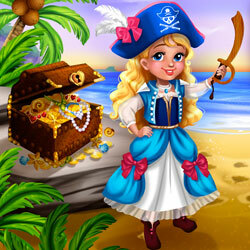 Description: Pirate Princess is an ambitious little girl who wants to find her way to the hidden treasure on a deserted island. But first, she's going to need your help finding the treasure map, so make sure you check every nook and cranny of her ship! Then, you'll have to style her hair, choose her outfit and pick her the perfect parrot companion. Arr matey, have fun!